"This is about us! As a society - what we want, what we seek." Mars Distribution in France has debuted a full-length international trailer for the film The Death and Life of John F. Donovan, the first English-language feature made by Quebecois filmmaker Xavier Dolan (of Laurence Anyways, Tom at the Farm, Mommy). This premiered at the Toronto Film Festival last fall, and received mixed reviews - some negative, some positive (I really loved it). This very personal film from Dolan follows a young closeted gay actor who recounts his early years before becoming famous, connecting with a young boy who he corresponds with for years through hand-written letters. It's a multi-narrative film, and very emotional, as expected with Dolan. Kit Harington stars as the titular John F. Donovan, and the film's great ensemble cast includes Jacob Tremblay, Natalie Portman, Susan Sarandon, Thandie Newton, Kathy Bates, Ben Schnetzer, Sarah Gadon, Emily Hampshire, and Jared Keeso. I'm a big fan of this film (read my full review), and I hope this gets a US release this year, because I know there will be an audience that connects with it. Enjoy. 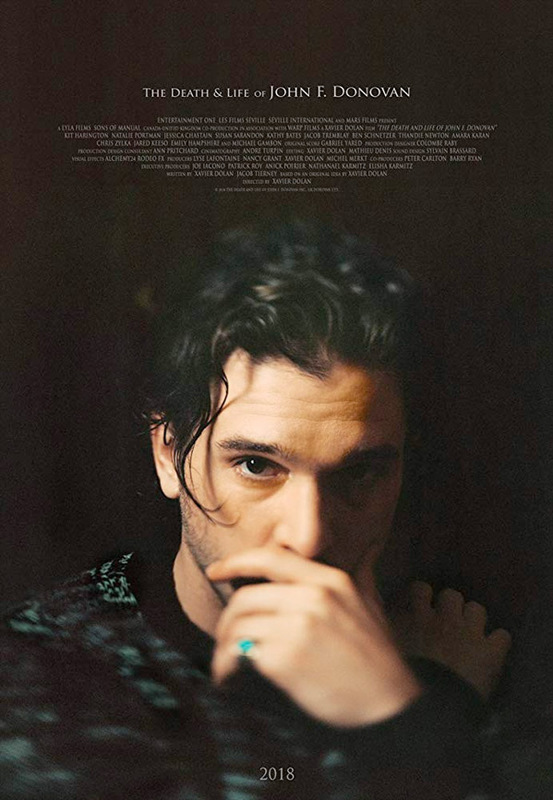 John F. Donovan (Kit Harington), heartthrob star of film and TV, died alone and unexpectedly following a series of scandals. One fan in particular, 11-year-old Rupert Turner (Room's Jacob Tremblay), has some singular insight into John's soul. For five years John and Rupert were secret pen pals. Fast-forward to the present. Rupert (Ben Schnetzer), now a successful actor in his own right, has written a memoir about his correspondence with John. In an interview with reporter Audrey Newhouse (Thandie Newton), Rupert will reveal all he knows about John's troubled life, what compromises John made for fame — and how John's tenderness and generosity inspired that little boy who was desperate to connect with the man he idolized (via TIFF). The Death and Life of John F. Donovan is directed by Quebecois filmmaker Quebecois filmmaker Xavier Dolan, of the films I Killed My Mother, Heartbeats, Laurence Anyways, Tom at the Farm, Mommy, and It's Only the End of the World previously. The screenplay is written by Xavier Dolan, with Jacob Tierney. This premiered at the Toronto Film Festival last fall (read our review). The film opens in France starting this March. There's still no official US release date set yet - stay tuned. First impression?